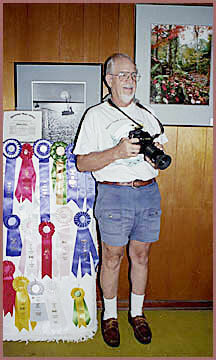 Bob is a "late bloomer" in the field of outdoor photography, only becoming serious after the age of fifty five. In a short twenty years, he is now considered one of the areas leading outdoor photographers. His photographs have appeared in Florida Wildlife Magazine; Blue Ridge Country Magazine; Shutterbug Magazine; EcoFlorida Magazine and Florida Today newspaper. Bob's articles on Florida wildlife with supporting photographs have been published in Florida Wildlife Magazine and EcoFlorida Magazine. An article titled "The Amazing Least Bittern" (EcoFlorida; Spring 2001) the most recent. His photographs have won numerous awards at juried art shows and exhibitions. "I enjoy the reaction people have to my photographs, especially when they see the color and markings God has created in birds and animals. They get a glimpse of our vanishing wildlife and environment that they have never seen before. The camera captures the moment and the resulting photograph can be around for a long time for people to enjoy." Click here for a price list of our photographs. Shipped directly to your home or office.